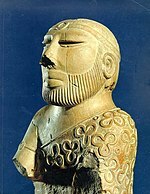 Some of the earliest ancient human civilisations in South Asia originated from areas encompassing present-day Pakistan.Ã‚Â The earliest known inhabitants in the region wereÃ‚Â SoanianÃ‚Â during theÃ‚Â Lower Paleolithic, of whom stone tools have been found in theÃ‚Â Soan ValleyÃ‚Â ofÃ‚Â Punjab.Ã‚Â TheÃ‚Â Indus region, which covers most of present day Pakistan, was the site of several successive ancient cultures including the Neolithic MehrgarhÃ‚Â and the Bronze AgeÃ‚Â Indus Valley CivilisationÃ‚Â (2,800Ã¢â‚¬â€œ1,800Ã‚Â BCE) atÃ‚Â HarappaÃ‚Â andÃ‚Â Mohenjo-Daro. TheÃ‚Â Vedic CivilisationÃ‚Â (1500Ã¢â‚¬â€œ500Ã‚Â BCE), characterised byÃ‚Â Indo-AryanÃ‚Â culture, during this period theÃ‚Â Vedas, the oldest scriptures associated with Hinduism, were composed and this culture later became well established in the region.MultanÃ‚Â was an important Hindu pilgrimage centre.Ã‚Â The Vedic civilisation flourished in the ancientÃ‚Â GandhÃ„ÂranÃ‚Â city of TakÃ¡Â¹Â£aÃ…â€ºilÃ„Â, nowÃ‚Â TaxilaÃ‚Â in the Punjab, which was founded around 1000 BCE.Ã‚Â Successive ancient empires and kingdoms ruled the region: the PersianÃ‚Â Achaemenid EmpireÃ‚Â (around 519Ã‚Â BCE),Ã‚Â Alexander the Great‘s empire in 326Ã‚Â BCEÃ‚Â and theÃ‚Â Maurya Empire, founded byÃ‚Â Chandragupta MauryaÃ‚Â and extended byÃ‚Â Ashoka the Great, until 185Ã‚Â BCE.Ã‚Â TheÃ‚Â Indo-Greek KingdomÃ‚Â founded byÃ‚Â Demetrius of BactriaÃ‚Â (180Ã¢â‚¬â€œ165Ã‚Â BCE) included Gandhara and Punjab and reached its greatest extent underÃ‚Â MenanderÃ‚Â (165Ã¢â‚¬â€œ150Ã‚Â BCE), prospering theÃ‚Â Greco-BuddhistÃ‚Â culture in the region.Ã‚Â Taxila had one of the earliest universities and centres of higher education in the world, which was established during the late Vedic period in 6th century BCE.Ã‚Â The school consisted of several monasteries without large dormitories or lecture halls where the religious instruction was provided on an individualistic basis.Ã‚Â The ancient university was documented by the invading forces of Alexander the Great, “the like of which had not been seen in Greece,” and was also recorded by Chinese pilgrims in the 4th or 5th century CE. At its zenith, theÃ‚Â Rai DynastyÃ‚Â (489Ã¢â‚¬â€œ632Ã‚Â CE) ofÃ‚Â SindhÃ‚Â ruled this region and the surrounding territories.Ã‚Â TheÃ‚Â Pala DynastyÃ‚Â was the last Buddhist empire, which, underÃ‚Â DharmapalaÃ‚Â andÃ‚Â Devapala, stretched across South Asia from what is nowÃ‚Â BangladeshÃ‚Â throughÃ‚Â Northern IndiaÃ‚Â to Pakistan. The Arab conquerorÃ‚Â Muhammad bin QasimÃ‚Â conquered theÃ‚Â Indus valleyÃ‚Â from Sindh to Multan in southern Punjab in 711Ã‚Â CE.Ã‚Â The Pakistan government’s official chronology identifies this as the time when the foundation of Pakistan was laid.Ã‚Â The Early Medieval period (642Ã¢â‚¬â€œ1219Ã‚Â CE) witnessed the spread ofÃ‚Â IslamÃ‚Â in the region. During this period,Ã‚Â SufiÃ‚Â missionariesÃ‚Â played a pivotal role in converting a majority of the regional Buddhist and Hindu population to Islam.Ã‚Â These developments set the stage for theÃ‚Â rule of several successive Muslim empiresÃ‚Â in the region, including theÃ‚Â Ghaznavid EmpireÃ‚Â (975Ã¢â‚¬â€œ1187Ã‚Â CE), theÃ‚Â GhoridÃ‚Â Kingdom, and theÃ‚Â Delhi SultanateÃ‚Â (1206Ã¢â‚¬â€œ1526Ã‚Â CE). TheÃ‚Â Lodi dynasty, the last of the Delhi Sultanate, was replaced by theÃ‚Â Mughal EmpireÃ‚Â (1526Ã¢â‚¬â€œ1857Ã‚Â CE). The Mughals introduced Persian literature and high culture, establishing the roots ofÃ‚Â Indo-Persian cultureÃ‚Â in the region.Ã‚Â From the region of modern-day Pakistan, key cities during the Mughal rule wereÃ‚Â LahoreÃ‚Â andÃ‚Â Thatta,Ã‚Â both of which were chosen as the site of impressiveÃ‚Â Mughal buildings.Ã‚Â In the early 16th century, the region remained under theÃ‚Â Mughal EmpireÃ‚Â ruled byÃ‚Â Muslim emperors.Ã‚Â By the early 18th century, increasing European influence contributed to the slow disintegration of theÃ‚Â empireÃ‚Â as the lines between commercial and political dominance became increasingly blurred. During this time, the EnglishÃ‚Â East India CompanyÃ‚Â had established coastal outposts.Ã‚Â Control over the seas, greater resources, technology, andÃ‚Â British military protectionÃ‚Â led the Company to increasingly flex its military muscle, allowing theÃ‚Â Company to gain controlÃ‚Â over theÃ‚Â subcontinentÃ‚Â by 1765 and sideline European competitors.Ã‚Â Expanding access beyondÃ‚Â BengalÃ‚Â and the subsequent increased strength and size of itsÃ‚Â armyÃ‚Â enabled it to annex or subdue most of region by the 1820s.Ã‚Â Many historians see this as the start of the region’s colonial period.Ã‚Â By this time, with its economic power severely curtailed by theÃ‚Â British parliamentÃ‚Â and itself effectively made an arm of British administration, theÃ‚Â CompanyÃ‚Â began more deliberately to enter non-economic arenas such as education, social reform, and culture.Ã‚Â Such reforms included the enforcement of theÃ‚Â English Education ActÃ‚Â in 1835 and the introduction of theÃ‚Â Indian Civil ServiceÃ‚Â (ICS).Ã‚Â TraditionalÃ‚Â madrasahsÃ‚Â Ã¢â‚¬â€ primary institutions of higher learning forÃ‚Â MuslimsÃ‚Â in theÃ‚Â subcontinentÃ‚Â Ã¢â‚¬â€ were no longer supported by theÃ‚Â English Crown, and nearly all of theÃ‚Â madrasahsÃ‚Â lost their financial endowment. The gradual decline of the Mughal Empire in the early 18th century enabled theÃ‚Â Sikh EmpireÃ‚Â to control larger areas until the BritishÃ‚Â East India CompanyÃ‚Â gained ascendancy over theÃ‚Â Indian subcontinent.Ã‚Â AÃ‚Â rebellionÃ‚Â in 1857 called theÃ‚Â Sepoy mutinyÃ‚Â was the region’s major armed struggle against theÃ‚Â British EmpireÃ‚Â andÃ‚Â Queen Victoria.Ã‚Â Divergence in theÃ‚Â relationshipÃ‚Â between Hinduism and Islam created a major rift inÃ‚Â British IndiaÃ‚Â that led to racially motivatedÃ‚Â religious violence in India.Ã‚Â TheÃ‚Â language controversyÃ‚Â further escalated the tensions between Hindus and Muslims.Ã‚Â TheÃ‚Â Hindu renaissanceÃ‚Â witnessed an awakening of intellectualism in traditionalÃ‚Â HinduismÃ‚Â and saw the emergence of more assertive influence in the social and political spheres in British India.Ã‚Â AnÃ‚Â intellectual movementÃ‚Â to counter theÃ‚Â Hindu renaissancewas led by SirÃ‚Â Syed Ahmad Khan, who helped found theÃ‚Â All-India Muslim LeagueÃ‚Â in 1901 and envisioned, as well as advocated for, theÃ‚Â two-nation theory.Ã‚Â In contrast to theÃ‚Â Indian Congress‘sÃ‚Â anti-BritishÃ‚Â efforts, the Muslim League was aÃ‚Â pro-BritishÃ‚Â movement whose political programÃ‚Â inherited the British valuesÃ‚Â that would shape Pakistan’s futureÃ‚Â civil society.Ã‚Â In events duringÃ‚Â World War I,Ã‚Â British IntelligenceÃ‚Â foiled anÃ‚Â anti-EnglishÃ‚Â conspiracyÃ‚Â involving the nexus of Congress and theÃ‚Â German Empire.Ã‚Â The largely non-violent independence struggle led by the Indian Congress engaged millions of protesters in mass campaigns ofÃ‚Â civil disobedienceÃ‚Â in the 1920s and 1930s against theÃ‚Â British Empire. Over 10 million people were uprooted from their homeland and travelled on foot, bullock carts, and trains to their promised new home during theÃ‚Â Partition of India. During the partition, between 200,000 to 2,000,000 people were killed in the retributive genocide. The Muslim League slowly rose to mass popularity in the 1930s amid fears of under-representation and neglect ofÃ‚Â MuslimsÃ‚Â inÃ‚Â politics. In his presidential address of 29 December 1930,Ã‚Â Allama IqbalÃ‚Â called for “the amalgamation ofÃ‚Â North-WestÃ‚Â Muslim-majority Indian states” consisting of Punjab,Ã‚Â North-West Frontier Province,Ã‚Â Sindh, andÃ‚Â Balochistan.Ã‚Â The perceived neglect of muslim interests by Congress ledÃ‚Â provincial governmentsÃ‚Â during the period of 1937Ã¢â‚¬â€œ39 convincedÃ‚Â Muhammad Ali Jinnah, the founder of Pakistan to espouse the two-nation theory and led the Muslim League to adopt theÃ‚Â Lahore ResolutionÃ‚Â of 1940, popularly known as the Pakistan Resolution.Ã‚Â InÃ‚Â World War II, Jinnah andÃ‚Â British-educatedÃ‚Â founding fathersÃ‚Â in the Muslim League supported the United Kingdom’sÃ‚Â war efforts, countering opposition against it whilst working towardsÃ‚Â Sir Syed‘sÃ‚Â vision. TheÃ‚Â 1946 electionsÃ‚Â resulted in the Muslim League winning 90Ã‚Â percent of the seats reserved for Muslims. Thus, the 1946 election was effectively a plebiscite in which the Indian Muslims were to vote on the creation of Pakistan, a plebiscite won by the Muslim League.This victory was assisted by the support given to the Muslim League by the rural peasantry of Bengal as well as the support of the landowners of Sindh and Punjab. TheÃ‚Â Congress, which initially denied the Muslim League’s claim of being the sole representative of Indian Muslims, was now forced to recognise the fact.Ã‚Â TheÃ‚Â BritishÃ‚Â had no alternative except to take Jinnah’s views into account as he had emerged as the sole spokesperson of India’s Muslims. However, the British did not want India to be partitioned, and in one last effort to prevent it they devised theÃ‚Â Cabinet Mission plan. As the cabinet mission failed, the British government announced its intention to end theÃ‚Â British RajÃ‚Â in India in 1946Ã¢â‚¬â€œ47.Ã‚Â NationalistsÃ‚Â in British IndiaÃ‚Â Ã¢â‚¬â€ includingÃ‚Â Jawaharlal NehruandÃ‚Â Abul Kalam AzadÃ‚Â of Congress, Jinnah of theÃ‚Â All-India Muslim League, andÃ‚Â Master Tara SinghÃ‚Â representing the SikhsÃ‚Â Ã¢â‚¬â€ agreed to the proposed terms of transfer of power and independence in June 1947 with theÃ‚Â Viceroy of India,Ã‚Â Lord Mountbatten of Burma.Ã‚Â As the United Kingdom agreed to theÃ‚Â partitioning of IndiaÃ‚Â in 1947, the modern state of Pakistan was established onÃ‚Â 14 August 1947Ã‚Â (27th ofÃ‚Â RamadanÃ‚Â in 1366 of theÃ‚Â Islamic Calendar), amalgamating theÃ‚Â Muslim-majorityÃ‚Â eastern and northwestern regions ofÃ‚Â British India.Ã‚Â It comprised the provinces ofÃ‚Â Balochistan,Ã‚Â East Bengal, theÃ‚Â North-West Frontier Province,Ã‚Â West Punjab, and Sindh. In the riots that accompanied the partition in Punjab Province, it is believed that between 200,000 and 2,000,000Ã‚Â people were killed in what some have described as a retributive genocide between the religionsÃ‚Â while 50,000 Muslim women wereÃ‚Â abducted and rapedÃ‚Â by Hindu and Sikh men and 33,000 Hindu and Sikh women also experienced the same fate at the hands of Muslims.Ã‚Â Around 6.5Ã‚Â million Muslims moved from India to West Pakistan and 4.7Ã‚Â million Hindus and Sikhs moved from West Pakistan to India.Ã‚Â It was the largest mass migration in human history.Ã‚Â Dispute overÃ‚Â Jammu and KashmirÃ‚Â led to theÃ‚Â First Kashmir WarÃ‚Â in 1948. 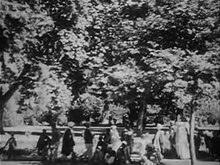 The AmericanÃ‚Â CIAÃ‚Â film on Pakistan made in 1950 examines the history and geography of Pakistan. AfterÃ‚Â independenceÃ‚Â in 1947, Jinnah, theÃ‚Â PresidentÃ‚Â of the Muslim League, became the nation’s firstÃ‚Â Governor-GeneralÃ‚Â as well as the firstÃ‚Â President-SpeakerÃ‚Â of theÃ‚Â Parliament,Ã‚Â but he died of tuberculosis on 11 September 1948.Ã‚Â Meanwhile, Pakistan’s founding fathers agreed to appointÃ‚Â Liaquat Ali Khan, theÃ‚Â secretary-generalof theÃ‚Â party, the nation’sÃ‚Â firstÃ‚Â Prime Minister. WithÃ‚Â dominion statusÃ‚Â in the Commonwealth of Nations, independent Pakistan had twoÃ‚Â British monarchsÃ‚Â before it became a republic. The creation of Pakistan was never fully accepted by many British leaders, among themÃ‚Â Lord Mountbatten.Ã‚Â Mountbatten clearly expressed his lack of support and faith in the Muslim League’s idea of Pakistan.Ã‚Â Jinnah refused Mountbatten’s offer to serve asÃ‚Â Governor-GeneralÃ‚Â of Pakistan.Ã‚Â When Mountbatten was asked by Collins and Lapierre if he would have sabotaged Pakistan had he known that Jinnah was dying of tuberculosis, he replied ‘most probably’. MaulanaÃ‚Â Shabbir Ahmad Usmani, a respected DeobandiÃ‚Â alimÃ‚Â (scholar) who occupied the position of Shaykh al-Islam in Pakistan in 1949, andÃ‚Â Maulana MawdudiÃ‚Â ofÃ‚Â Jamaat-i-Islamiplayed a pivotal role in the demand for an Islamic constitution.Ã‚Â MawdudiÃ‚Â demanded that the Constituent Assembly make an explicit declaration affirming the “supreme sovereignty of God” and the supremacy of theÃ‚Â shariahÃ‚Â in Pakistan. A significant result of the efforts of the Jamaat-i-Islami and theÃ‚Â ulamaÃ‚Â was the passage of theÃ‚Â Objectives ResolutionÃ‚Â in March 1949. The Objectives Resolution, whichÃ‚Â Liaquat Ali KhanÃ‚Â called the second most important step in Pakistan’s history, declared that “sovereignty over the entire universe belongs to God Almighty alone and the authority which He has delegated to the State of Pakistan through its people for being exercised within the limits prescribed by Him is a sacred trust”. The Objectives Resolution has been incorporated as a preamble to the constitutions of 1956, 1962, and 1973. DemocracyÃ‚Â was stalled by theÃ‚Â martial lawÃ‚Â that had been enforced by PresidentÃ‚Â Iskander Mirza, who was replaced byÃ‚Â army chief, GeneralÃ‚Â Ayub Khan. After adopting aÃ‚Â presidential systemÃ‚Â in 1962, the country experienced exceptional growth until aÃ‚Â second warÃ‚Â withÃ‚Â IndiaÃ‚Â in 1965 that led to an economic downturn and wide-scaleÃ‚Â public disapprovalÃ‚Â in 1967.Ã‚Â ConsolidatingÃ‚Â control from Ayub Khan in 1969, PresidentÃ‚Â Yahya KhanÃ‚Â had to deal with a devastatingÃ‚Â cycloneÃ‚Â that caused 500,000 deaths inÃ‚Â East Pakistan. 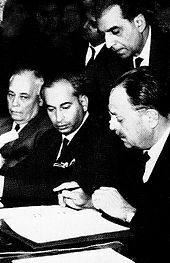 In 1970 Pakistan held itsÃ‚Â first democratic electionsÃ‚Â since independence, meant to mark a transition fromÃ‚Â military ruleÃ‚Â to democracy, but after the East PakistaniÃ‚Â Awami LeagueÃ‚Â won against theÃ‚Â Pakistan Peoples PartyÃ‚Â (PPP), Yahya Khan and the military establishment refused to hand over power.Ã‚Â Operation Searchlight, a military crackdown on the Bengali nationalist movement, led to a declaration of independence and the waging ofÃ‚Â a war of liberationÃ‚Â by the BengaliÃ‚Â Mukti BahiniÃ‚Â forces in East Pakistan, with support from India.Ã‚Â However, in West Pakistan the conflict was described as a civil war as opposed to a war of liberation. Independent researchers estimate that between 300,000 and 500,000 civilians died during this period while the Bangladesh government puts the number of dead at three million,Ã‚Â a figure that is now nearly universally regarded as excessively inflated.Ã‚Â Some academics such asÃ‚Â Rudolph RummelÃ‚Â andÃ‚Â Rounaq JahanÃ‚Â say both sidesÃ‚Â committed genocide; others such asÃ‚Â Richard SissonÃ‚Â and Leo E. Rose believe there was no genocide.Ã‚Â In response to India’s support for the insurgency in East Pakistan,Ã‚Â preemptive strikesÃ‚Â onÃ‚Â IndiaÃ‚Â by Pakistan’sÃ‚Â air force,Ã‚Â navy, andÃ‚Â marinesÃ‚Â sparked aÃ‚Â conventional warÃ‚Â in 1971 that resulted in an Indian victory andÃ‚Â East PakistanÃ‚Â gainingÃ‚Â independenceÃ‚Â as Bangladesh. With PakistanÃ‚Â surrenderingÃ‚Â in the war, Yahya Khan was replaced byÃ‚Â Zulfikar Ali BhuttoÃ‚Â as president; the country worked towards promulgating itsÃ‚Â constitutionÃ‚Â and putting the country on the road to democracy. Democratic rule resumed from 1972 to 1977Ã‚Â Ã¢â‚¬â€ an era of self-consciousness, intellectualÃ‚Â leftism,Ã‚Â nationalism, and nationwide reconstruction.Ã‚Â In 1972 Pakistan embarked on an ambitious plan to develop itsÃ‚Â nuclear deterrenceÃ‚Â capability withÃ‚Â the goal of preventingÃ‚Â anyÃ‚Â foreign invasion; the country’sÃ‚Â firstÃ‚Â nuclear power plantÃ‚Â was inaugurated in that same year.Ã‚Â Accelerated in response to India’sÃ‚Â first nuclear testÃ‚Â in 1974, thisÃ‚Â crash programÃ‚Â was completed in 1979. Democracy ended with aÃ‚Â military coupÃ‚Â in 1977 against theÃ‚Â leftistÃ‚Â PPP, which sawÃ‚Â General Zia-ul-HaqÃ‚Â become the president in 1978. From 1977 to 1988, President Zia’sÃ‚Â corporatisationÃ‚Â andÃ‚Â economic IslamisationÃ‚Â initiatives led to Pakistan becoming one of the fastest-growing economies in South Asia.Ã‚Â While building up the country’sÃ‚Â nuclear program, increasingÃ‚Â Islamisation,Ã‚Â and the rise of a homegrownÃ‚Â conservativeÃ‚Â philosophy, Pakistan helped subsidise and distribute USÃ‚Â resources to factionsÃ‚Â of theÃ‚Â mujahideenÃ‚Â against theÃ‚Â USSR‘sÃ‚Â interventionÃ‚Â inÃ‚Â communistÃ‚Â Afghanistan.Ã‚Â Pakistan’sÃ‚Â North-West Frontier ProvinceÃ‚Â became a base for the anti-Soviet Afghan fighters, with the province’s influentialÃ‚Â DeobandiÃ‚Â ulama playing a significant role in encouraging and organising the ‘jihad’. President Zia diedÃ‚Â in a plane crash in 1988, andÃ‚Â Benazir Bhutto, daughter of Zulfikar Ali Bhutto, was elected as the country’sÃ‚Â first femaleÃ‚Â Prime Minister. The PPP was followed by conservativeÃ‚Â Pakistan Muslim League (N), and over the next decade the leaders of the two parties fought for power, alternating in office while the country’s situation worsened; economic indicators fell sharply, in contrast to the 1980s. This period is marked by prolongedÃ‚Â stagflation, instability,Ã‚Â corruption,Ã‚Â nationalism,Ã‚Â geopoliticalÃ‚Â rivalry withÃ‚Â India, and the clash ofÃ‚Â left wing–right wingÃ‚Â ideologies.Ã‚Â AsÃ‚Â PML(N)Ã‚Â secured aÃ‚Â supermajorityÃ‚Â inÃ‚Â electionsÃ‚Â in 1997, Sharif authorisedÃ‚Â nuclear testingsÃ‚Â (See:Chagai-IÃ‚Â andÃ‚Â Chagai-II), as aÃ‚Â retaliationÃ‚Â to theÃ‚Â second nuclear testsÃ‚Â ordered by India, led by Prime MinisterÃ‚Â Atal Bihari VajpayeeÃ‚Â in May 1998. PresidentÃ‚Â George W. BushÃ‚Â meets with PresidentÃ‚Â MusharrafÃ‚Â inÃ‚Â Islamabadduring his 2006 visit to Pakistan. Military tension between the two countries in theÃ‚Â Kargil districtÃ‚Â led to theÃ‚Â Kargil WarÃ‚Â of 1999, and turmoil inÃ‚Â civic-military relationsÃ‚Â allowed GeneralÃ‚Â Pervez MusharrafÃ‚Â to take over through aÃ‚Â bloodless coup d’ÃƒÂ©tat.Ã‚Â Musharraf governed Pakistan asÃ‚Â chief executiveÃ‚Â from 1999 to 2001 and as President from 2001 to 2008Ã‚Â Ã¢â‚¬â€ a period ofÃ‚Â enlightenment, socialÃ‚Â liberalism, extensiveÃ‚Â economic reforms,Ã‚Â andÃ‚Â direct involvementÃ‚Â in the US-ledÃ‚Â war on terrorism. When theÃ‚Â National AssemblyÃ‚Â historically completed its first full five-year term on 15 November 2007, the new elections were called by theÃ‚Â Election Commission. After theÃ‚Â assassinationÃ‚Â ofÃ‚Â Benazir BhuttoÃ‚Â in 2007, theÃ‚Â PPPÃ‚Â secured theÃ‚Â most votesÃ‚Â in theÃ‚Â electionsÃ‚Â of 2008, appointing party memberÃ‚Â Yousaf Raza GillaniÃ‚Â as Prime Minister.Ã‚Â Threatened withÃ‚Â impeachment, President Musharraf resigned on 18 August 2008, and was succeeded byÃ‚Â Asif Ali Zardari.Ã‚Â Clashes with theÃ‚Â judicatureÃ‚Â promptedÃ‚Â Gillani‘s disqualification from theÃ‚Â ParliamentÃ‚Â and as theÃ‚Â Prime MinisterÃ‚Â in June 2012.Ã‚Â By its own financial calculations, Pakistan’sÃ‚Â involvementÃ‚Â in theÃ‚Â war on terrorismÃ‚Â has cost up to ~$118Ã‚Â billion,Ã‚Â sixty thousand casualtiesÃ‚Â and more than 1.8Ã‚Â million displaced civilians.Ã‚Â TheÃ‚Â general electionÃ‚Â held in 2013 saw the PML(N) almost achieve aÃ‚Â supermajority, following whichÃ‚Â Nawaz SharifÃ‚Â was elected as the Prime Minister, returning to the post for the third time in fourteen years, in a democratic transition.